The ‘4K Evolution’ is unfolding faster than anyone could have predicted. While wave after wave of cameras, televisions, monitors and even smartphones have all adopted 4K - the revolution of very high definition content fueled by new monetization capabilities is upon us. Are you prepared for this 4K world? 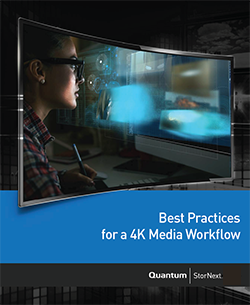 Check out Quantum’s new 4K eBook “Best Practices for a 4K Media Workflow”. Hear from top industry experts as they will show you how they are successfully growing in this 4K and beyond world. Fill out the form and get instant access to our new 4K eBook!